WHEN you reach a certain age it is highly recommended to travel places where you are likely to be with others of a similar age. I have never made the mistake of finding myself on a tour where everyone is a few decades younger than I am. It might be fun for me, but pity the poor young folk. In a surprising turn of events, I once went on a river cruise with my trusty travel mate (patient, long-suffering husband, up there in age stakes with me) and we were the youngest on board. During the day we had to dodge the walking frames but come evening, when the band struck up, those oldies hit the dance floor with some impressive Beyonce-style moves. On Anacapa Island off the coast of California some years ago I found myself in a tour group with a bunch of oldies and I admit it made me nervous. This was not a resort island, but a nature island, home to more than a thousand animal and plant species and an untold number of seabirds. There was to be a great deal of walking and hill climbing involved. "These old people will never make it up the first hill," I whispered to my own old bloke as we set off. Well, out of sturdy backpacks came sensible shoes, light rain coats, protective hats and impressive collapsible hiking sticks, all quickly put on and assembled, and off dashed the oldies like topline sprinters out of the starting blocks at the Olympics. These same people gathered importantly around the tour leader when he stopped every 10 minutes to point out in-depth detail of the island's ecology. They nodded seriously, took notes and were ready to dash off to the next point of interest while I stood puffing and bewildered and vowing never again to harbour patronising thoughts. TAKE ME to the mighty Murray River where the handsome limestone cliffs rise from the water and never fail to impress with their grandeur. 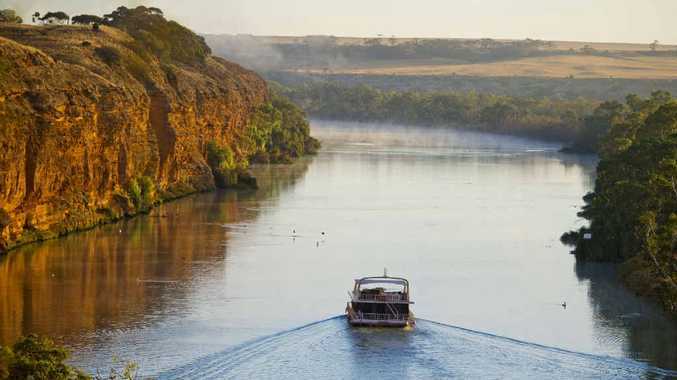 This ancient river system meanders through 600km of South Australia, to the Coorong region, and is a wonderland of wildlife and national parks and one of Australia's important wetlands.